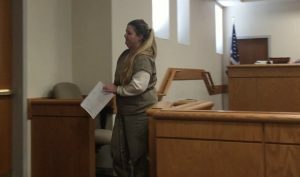 Whitney Baker Howard, who was involved in the vehicle accident that killed bicyclist Ashley Block, appeared in court on Monday for two hearings about two different DUI arrests she had during the summer of 2016. Howard faces separate charges of homicide by vehicle, endangering the life of a child and additional DUI charges for a car accident that killed Ashley Block and injured two others in September. Her next court date for that trial is in April. Her first DUI however occurred on June 9, 2016 and a second occurred two months later August 26. In both cases, Howard was involved in minor car accidents. Her defense attorney, Jason Spicer filed motions in both hearings to suppress evidence against Howard. In the hearing for her June 9 charges, the defense argued that she was confused at the time of her drug testing and could not consent to giving one. Athens-Clarke County Solicitor General C.R. Chisholm showed Howard’s arresting officer’s body camera footage. He argued the footage illustrated that although Howard was impaired by her use of drugs, she seemed to be understanding what was happening to her. “Ms. Howard, in this case does express some times that she might be confused about some things, but she clearly understands the situation overall.” Said Chisholm in court on Monday February 27. Judge Ethelyn Simpson ruled against the motion in June 9 hearing and will allow the evidence to be used in the trial. In the hearing for the August 26 case, the defense tried to suppress evidence found from the officer’s search of her vehicle during her arrest. Spicer argued that the search of her purse was illegal and thus required permission from Howard. Judge Simpson is still reviewing relevant precedent for the August 26 case to determine a ruling on whether to allow the evidence in trial. Howard’s court date for the DUI’s is in March. She remains in the Clarke County jail.